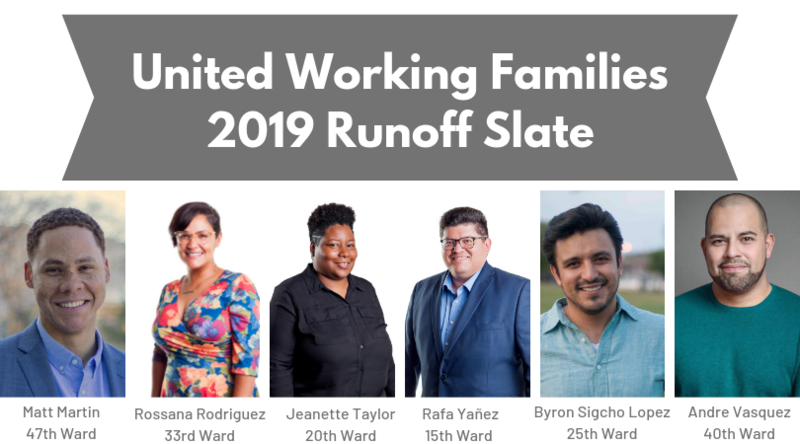 I'm so proud to announce that the United Working Families Party Committee has made two additional endorsements for the April 2 runoff election: Byron Sigcho-Lopez for 25th Ward Alderman and Andre Vasquez for 40th Ward Alderman. Byron Sigcho-Lopez is a founding member of UWF affiliate 25th Ward Independent Political Organization and the former director of Pilsen Alliance, where he has led Black and Latinx coalitions in fights against school closings and gentrification. Andre Vasquez, a lifelong Chicagoan and the son of immigrants, is challenging a 35-year incumbent who was part of the racist white voting bloc on City Council that fought Harold Washington, Chicago's first Black mayor. Rafael Yañez (15th Ward), a southwest side community leader who has provided violence prevention services to thousands of young people and a vocal opponent of the proposed police academy. Jeanette Taylor (20th Ward), who led the month-long hunger strike to save Dyett high school and who was recruited to run by the organizers fighting for a Community Benefits Agreement for the Obama Center coming to Woodlawn. Rossana Rodríguez (33rd Ward), an arts educator and affordable housing activist who was recruited to run by UWF affiliate 33rd Ward Working Families, which formed after the 2015 elections. Matt Martin (47th Ward), a civil rights attorney who worked on police reform and fought against Trump’s immigration policies at the Attorney General's office. Our member organizing and fundraising committees are busy mobilizing to make sure our slate has the people power they need to win on April 2. Join us! Sign up to volunteeror make a donation here. Older PostSTATEMENT: We're fighting #ForTheMany, and we are winning.